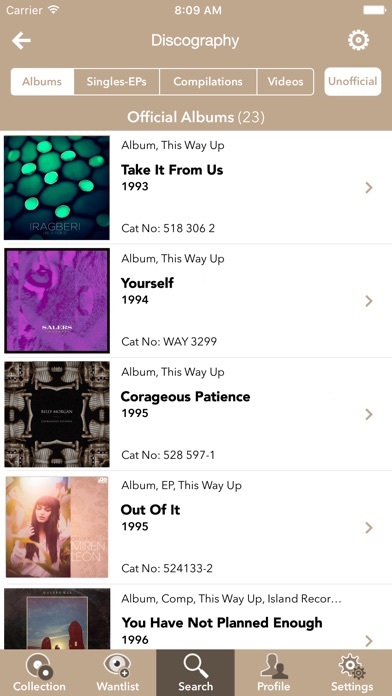 Discographic is the best and most complete Discogs app currently available. Wether it’s adding a disc to an existing collection, starting a new discography or checking out album details in-store, Discographic does it all. 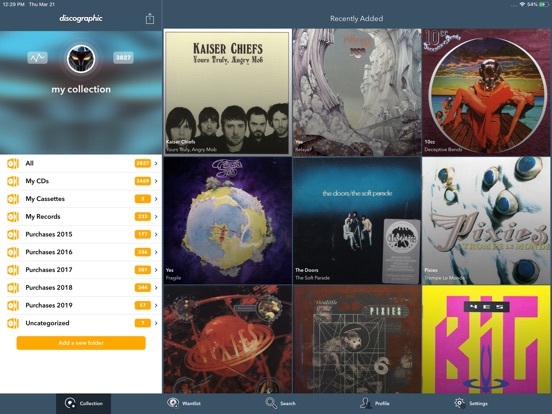 "This is the best discogs app / music collecting app out there." 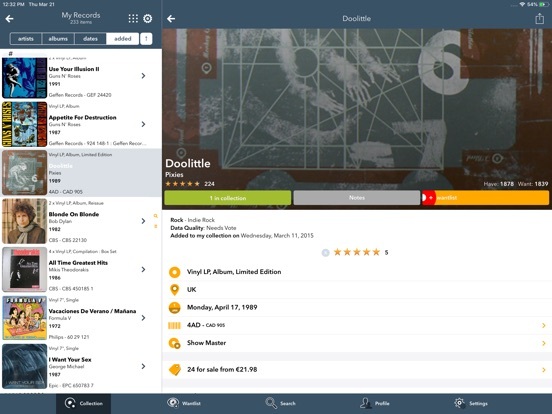 "Great little app and is still better than the Discogs app." "The layout and functionality of this app is clean and simple and it displays more information than the official Discogs app." "I absolutely love this app! It has everything I need and more, with the best interface and design." 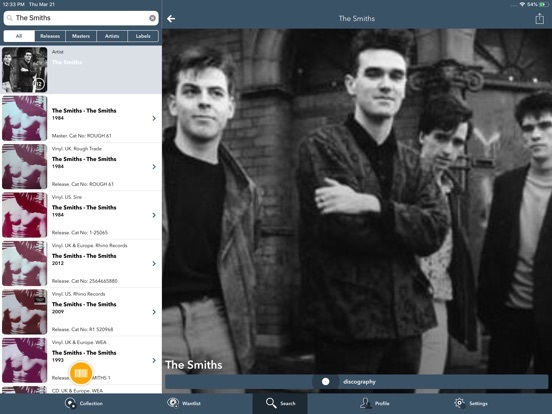 "This is the most feature packed discogs app I have used". "First impressions this is a winner. I like the ability to change color and clear the cache in settings. Lots of apps could learn from those details". "I highly recommend this app. It's worth the money and the support has been quick and helpful." "This was my favorite app for a multitude of reasons. 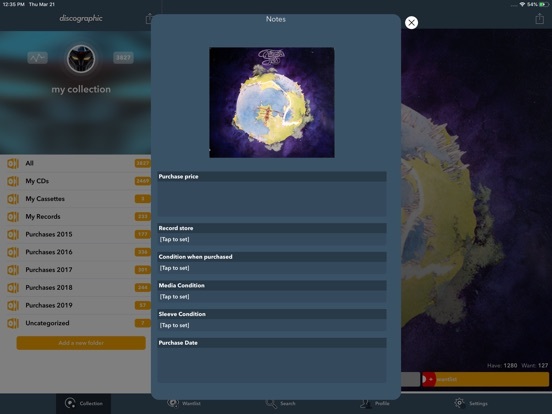 Navigation, visuals/images, ease of use, and more. 5 stars." "I find that the features it has in common with the official app tend to be slightly better to use." "I find myself using this app daily to review my collection and check/manage my wish list." 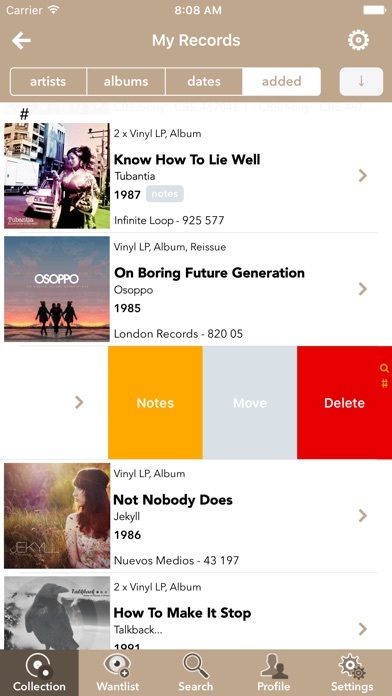 "Adding new entries to your collection is as easy as pointing your mobile at the record barcode and voilà!". Featured in WaxTimes (http://bit.ly/1bf3Min), Fact Magazine (http://bit.ly/1GOngnz) and AppSpezis (http://bit.ly/1HKO9xS) etc. 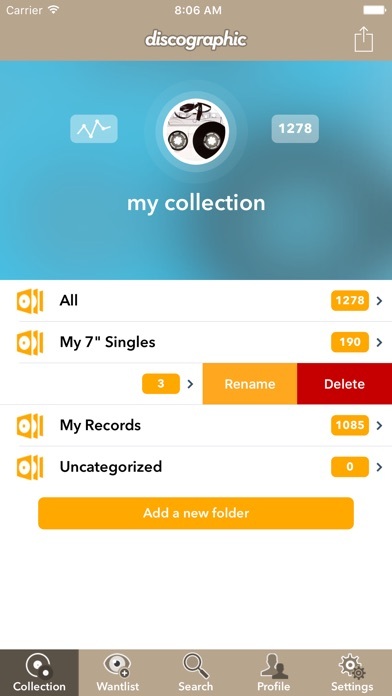 -Add and remove items from your Collection, move them between folders. -Use its barcode scanner to add record easily or search for them by catalog number, artist or title. -Create folders, rename or delete them. -Order your listings by artist, title, date, etc. and filter them by keywords. -Add custom notes and edit condition grades. All of your Collection custom user fields are displayed and editable, including ratings. -Carry your Wantlist everywhere you go. -Add and remove items from your Wantlist on the go. -All your Collection and Wantlist will be always synced between your device and server. -Filter your searches by category to make them more powerful. -Browse image galleries of releases, masters, artists and labels where available. -Save your search results for offline display. -Take with you all your Inventory with all the info available. 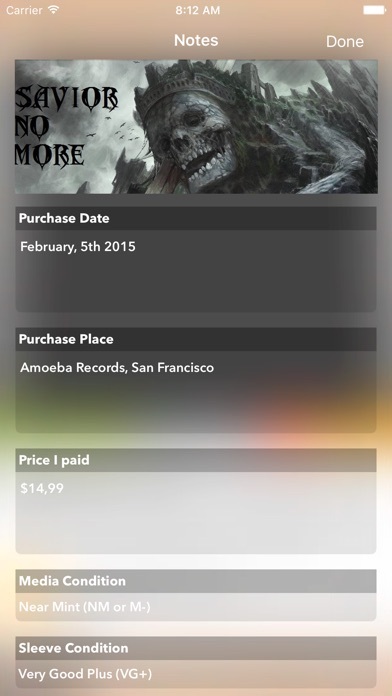 -Check the marketplace for releases you want to acquire and compare prices. 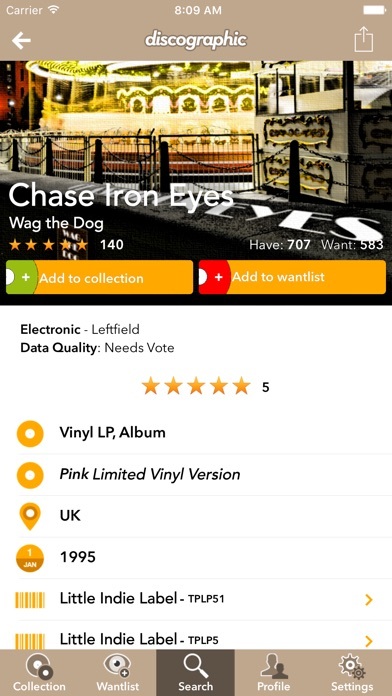 All Discogs prices are saved and always available on the app, including History Sales stats. -Check to see if you already own a record before you buy. 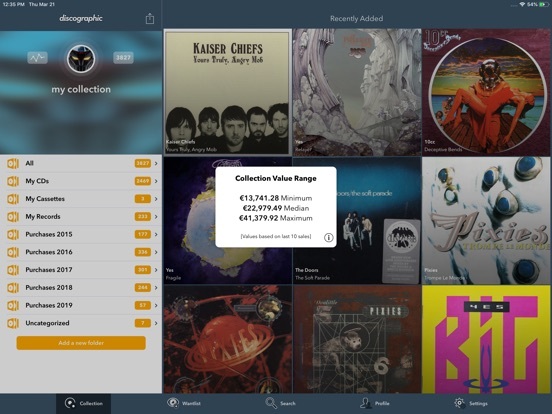 -Your Collection, Wantlist, Seller Inventory and every bit of data displayed by the app is conveniently cached in order to make every record on your collection available at any time. -This includes masters, releases, artists, labels, Marketplace info, Sales History, your Collection Value Range, your custom searches, etc. -You can remove all cached files at any time if you need you free space on your device. -You can export your Collection, Wantlist and Inventory to Excel-compatible format directly from the app, including custom notes and comments. 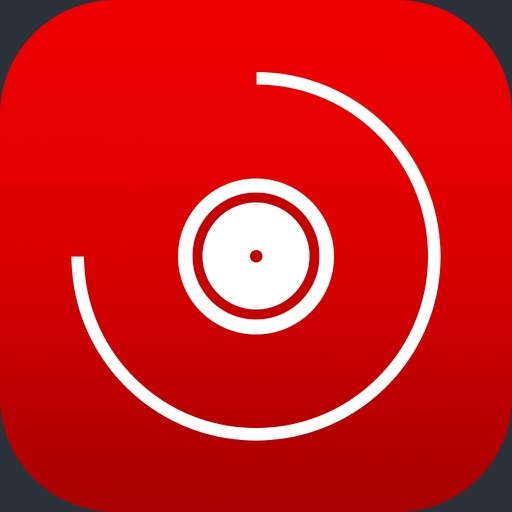 -You can scrobble tracks or albums directly from the app (a Last.FM account is needed to use this feature). -You can customize color schemes and display options. -You can change users on the app. All data by user is saved locally. + Bug fixes and speed enhancements.